Located in the center of Xi'an in Shaanxi province of China, the Drum Tower of Xi'an is one of the symbolic buildings of the city, along with the Bell Tower to its east. These two are often referred as "sister towers" in the Bell Tower and Drum Tower Square. The Drum Tower got its name from a huge drum inside. The drum was beat at sunset to mark the end of the day, in contrast with the bell striking at dawn. The original drum that gives the Tower the name has been long gone. But on the first floor of the Tower now hangs 24 drums, each of which is decorated with beautiful Chinese characters of the 24 solar terms of the lunar calendar. The Drum Tower in Xian was initially built in 1380, 4 years earlier than the Bell Tower. Later it is renovated twice in Qing Dynasty (1644-1911). Its architectural style is similar to the Bell Tower, with dark green glazed tiles on the eaves, gold-plating on the roof impacting a sense of magnificence and splendor. But one unique feature must be mentioned is that there is no iron nail used in the Drum Tower. 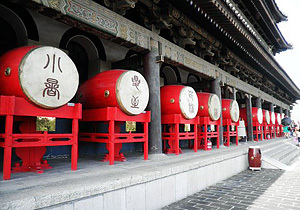 In the Drum Tower you can find a drum museum, where a variety of drums are on display, one of which is listed in the Guinness Book of Records as the largest drum in the world. Moreover, drum shows are performed here for several times everyday. However, as commerce developing quickly around the Bell Tower and Drum Tower Square, it is seemingly impossible to get a photograph of the Drum Tower while avoiding McDonald's.